Very few films have been as influential and have left such an inexhaustible impression on the genre as John Carpenter’s 1978 chiller classic Halloween. Yeah, there’d already been a bevy of run-after slasher films with beastly boogeyman-like brutes such as Bob Clark’s Black Christmas (1974), and Tobe Hooper’s The Texas Chainsaw Massacre (1974), but even those formidable spine-chillers weren’t quite like this nimbly sophisticated fright flick. Carpenter and co-producer Debra Hill (also his girlfriend at the time) wrote the Halloween script, originally titled “The Babysitter Murders”, hastily, in a mere two weeks. Shot on a shoestring budget on the quick, neither were aware that it would go on to gross close to $100 million and become one of the most successful small-scale indies in history. 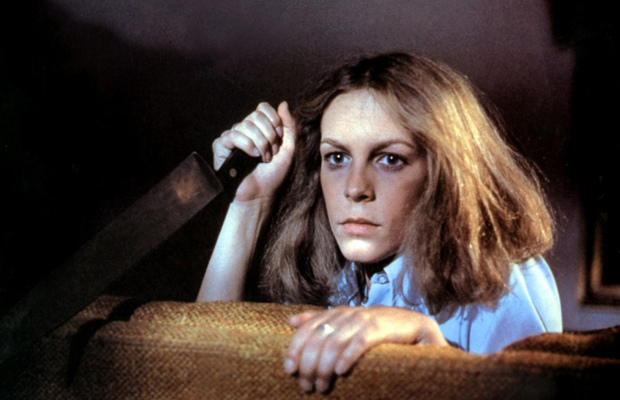 An unembellished and bare-bones plot about mental patient escapee Michael Myers (Nick Castle)––credited only as “The Shape” and never called by his full name in the film––donning a near featureless mask and haunting and hounding teenage babysitter Laurie Strode (future “scream queen” Jamie Lee Curtis in her breakout role) would portray predator-prey archetypes to startling purpose. There’s no such thing as the Boogeyman, is there? Carpenter, using a simplistic subjective camera with wicked widescreen framing, and a startling soundtrack––composed by himself with effectively eerie incessantly repetitive notes, an homage to Goblin’s work on Dario Argento’s 1975 giallo jewel, Deep Red––would stir distress and terrible shock value for decades to follow. Unnerving long takes, brilliantly agitated pacing, and protracted, on-edge confrontations between Michael and Laurie left lasting impressions on audiences. Viscerally thrilling and sensationally scary, Halloween’s impact and ascendency is undeniable. 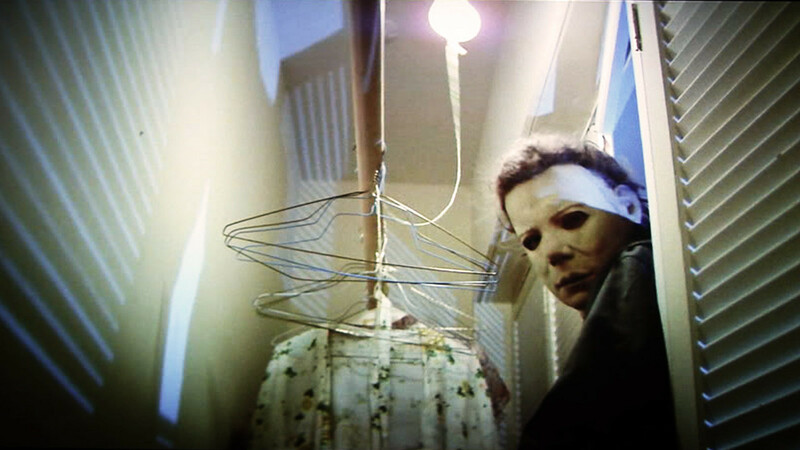 An upsetting preamble opens the film, a remarkably executed point-of-view single take, from the eyes of Michael Myers. It’s Halloween night 1963, in Haddonfield, Illinois, and six-year-old Michael is about to brutally murder his 17-year-old sister, Judith (Sandy Johnson) with a nasty kitchen knife. Sentenced and locked away at Smith’s Grove Sanitarium the narrative jumps ahead 15 years to October 30, 1978. While being shuffled around for a court date, Michael Myers, now in his 20s, steals a car and escapes. With an uncertain and alarmed Dr. Samuel Loomis (Donald Pleasence) in pursuit, the stage is set with substantial nightmare fuel. Halloween is deeply fixed with our primal and elemental anxieties, due in large part to Carpenter’s Hitchcockian sensibility for seizing and showing the enticing and tempting voyeurism that suspense films prize and applaud. This Hitchcock hookup and obeisance is further underscored in the casting of a then unknown Curtis, the daughter of Janet Leigh (Marion Crane in Psycho) as well as more directly in the names of several characters in the film. Dr. Sam Loomis is named after Marion’s lover in Psycho and Tommy Doyle (Brian Andrews), the boy whom Laurie is babysitting, is named after the New York City Police detective in Rear Window. How’s that for homage? Much of the tenseness and severity in Carpenter and Hill’s screenplay is due to the hushed, calm and low-key suburban setting. The edifying Americana visage and the idea of the insulating and impregnable household is not the traditional context for terror, at least not in 1978. Haddonfield could be any town in the impervious American bosom, so why mess with that bulwark? You wouldn’t mess with apple pie, would you? From ghastly start to frightening finish and all points inbetween, there is always someone watching in Halloween. Out of closets, through darkened windows, over shoulders, around corners, between the hedgerows, eyes straining in the gloom, making certain that some form of annihilation is forever on the periphery. Carpenter carefully constructed so many adrenaline pouring long takes, often at an agonizing lick as we, the imperiled viewer, must see Michael shirking in the shadows time and again. He hounds Laurie, who is defiant and staunch, she defends herself and wreaks vengeance and yet he cannot be stopped for long. He seems to rise from eternal rest again and again. Even Dr. Loomis, firing repeatedly at Michael at close range, seems only able to hinder him but briefly. As this war of attrition between good and evil reaches the finish there is still a substantial serving of plot unresolved. This lack of verdict and incomplete closure would become an unfailing slasher staple, as evidenced in films like Friday the 13th (1980), Candyman (1992), Scream (1996), and It Follows (2014), to name a few. And while Halloween would sire numerous sequels, ripoffs, and remakes, none would have the efficacy, prestige, or power to paralyze that the original has. And something else that Halloween does that too few films of its ilk have managed is to leave us all uncomfortably questioning the thin filament intervening fact and fiction, tangibility and nightmare, as well as the texture and verisimilitude of evil. Chilling stuff from the Master of Horror.